“Jeremy” was written in the wake of a high school shooting orchestrated by the aptly-named Jeremy Wade Delle, in Dallas, Texas – a city, and state, that apparently seems to value their hunting rifles, far more than the air they’re supposed to breathe, and the planet they’re supposed to live on. I mean, neglectful parents are one thing, but living in an environment where it’s every man, woman, and child for themselves, on top of that neglect, is a pretty scary concept for anyone to wrap their head around. Even their educational system glorifies survival of the sickest, and false lyrics like this aren’t going to help with matters any time soon. 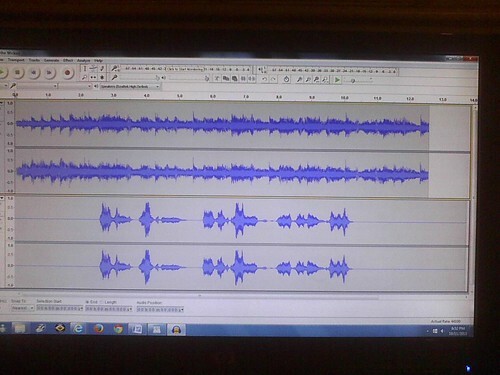 It actually took a while for me to edit both the original track, which I lifted from the music video using a website that specializes in MP3 conversion, and my voice, which I created a second file with using the Sound Recorder feature on my laptop, with the Audacity feature on my main computer. It was about as confusing as that last sentence. Once I did, though, everything clicked into place, and my finished product was uploaded onto SoundCloud, for three-and-a-half stars, out of five for these two weeks.